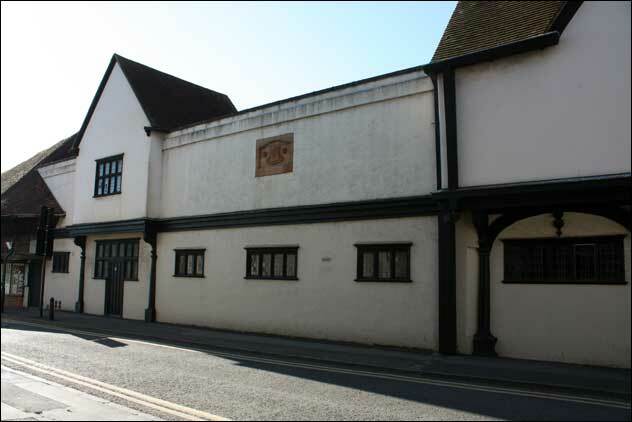 The refurbishment of the West Berkshire Museum, including the Cloth Hall and the Corn Store is now complete. During June and July, the artefacts which are currently in storage will be unpacked and arranged for display within the building. The museum is expected to re-open to the public before the end of August. Have to say, wholly disagree! I suppose it is 'in the eye of the beholder', but to my mind what has been put up is far more attractive than what went before. 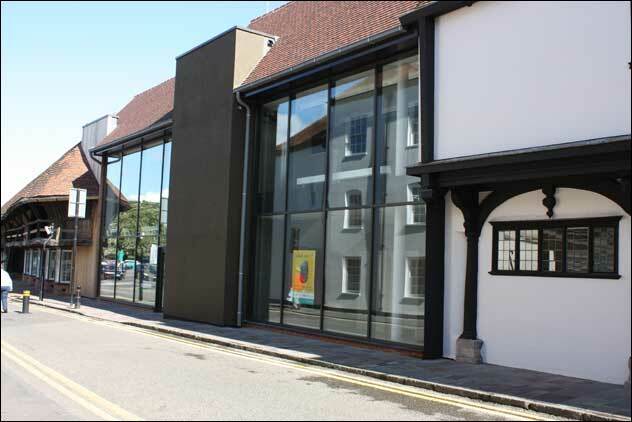 It does pull the two historic buildings together - without intruding itself. At last, we have something worthy of the Town! I must admit I personally think the new build leaves a lot to be desired. It looks likle someone "trying to make their mark" the colour of the central section should be the same as the exisitng building (to blend in a bit at least) and it would have been nice if they had at least kept the old crest and re-instated that on that part of the building. The large expanse of glass would look more at home in somewhere like London (I know that is the modern way but this is a Museum not an art gallery) something more sympathetic to its surroundings would have been better IMHO. No sign of museum staff rushing to get those artefacts back on the shelf. Will it really be reopening this year? I believe the 'old crest' is supposed to be going back to its original place with Queen Vic. The museum is due to open in late August. With the amount of smashed windows in town,lately,it won't be long before it's targeted. Sadly, I'd have to agree with you! It's pretty pointless doing anything much round here, because some of the locals are just intent in turning it into to a slum. For instance, there is a nice riverside walk, along the Lambourn from the new houses where it looks as if the refuse lorry delivers! Have to say I disagree! In my eye the new structure is far too big and overpowering, hiding the end of the Cloth Hall and generally looming over the old buildings - thoroughly intrusive! And the decision to have a plate glass window on to the street looking in at two toilet doors is bizarre to say the least. The biggest disappointment with the museum is the content. They seem to have lost the plot, it's now just a municipal tea shop. Sad really! 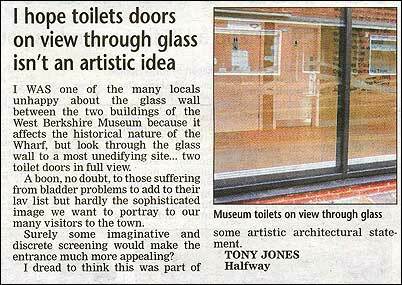 Frankly, against its failure to deliver what most think a museum should be doing, the sight of a toilet door sign through the window is nothing. Aren't our priorities slightly out of kilter? I agree, however, they made it more modern, destroying its history, however, and I thought that defeated the object. The 'bit in the middle' wasn't particularly old. It dated back to the mid 1930s and the design was really no more than a stage set - simply a corridor joining the two old bits together. Certainly very little thought went into it which then didn't matter because the area was pretty unkempt anyway. Newbury has always struck me as being a bit odd when it comes to decent design, just look at the number of people who apparently preferred what was a good imitation of a derelict bomb site to Parkway!